After telling myself I should get down and write a proper blog post I managed to concentrate and get it done. Well kind of. I may have a complicated relationship with airplanes, which includes an indescribable love when I am firm on the ground all the way to pure terror when clutching the arm rests during the slightest turbulence. In the recent months I was occupied with work and didn’t had the opportunity to travel. But as much as I like to blame other factors for the decline in my travels, the main one was me trying to avoid getting on a plane. So few months passed and my managers decided it was time I conquire my fears and hop on a plane to the company’s sister office in Jakarta. So I did what every normal adult person would do – I tried to find as many excused not to go as there possibly were. But, I think you are guessing where this is leading to – few days later I was on board Jetstar morning flight to Jakarta, as terrified as I can possibly be. The flight was normal with just a little bit of turbulence so I panicked to a reasonable level and not the OH MY GOD SHE MIGHT BE CRAZY GET HER OUT OF THE AIRCRAFT level. And it was this particular trip with this airline company that convinced me it was time to give flying another chance. Because this is what adults do right? You take something you don’t like and convince yourself it wasn’t all that bad. Then you decide to give it another chance. 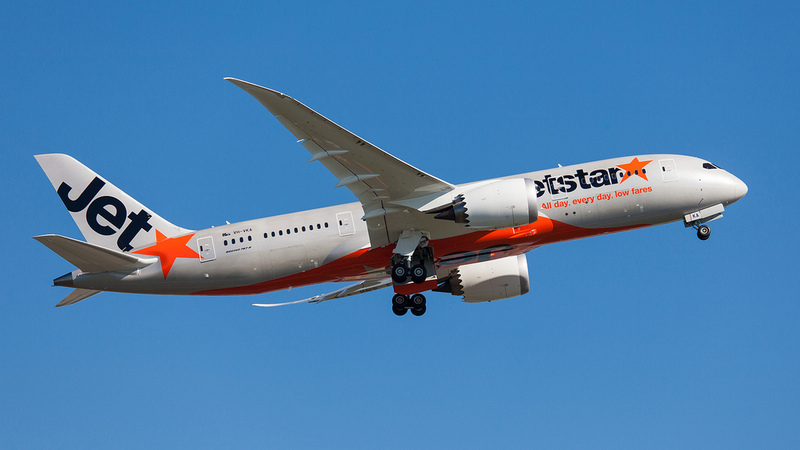 And here is a picture of Jetstar airplane, that I obviously didn’t take. But hey what is a blog post without a fancy photo?! So after I came back from my vacation work trip to Jakarta I booked tickets to a far away destination, that required 17 hours of air travel. But I will cover this topic in another post. P.S. The opinion in this article is mine. I haven’t been sponsored in any way to write and publish this. Like you know, being offered a free seat or bribed with preheated food or canned chips. When I think about it there is not much a budget airline can offer in terms of bribing. As a person that doesn’t like flying, I think Jetstar is one of the best budget airlines in Asia. Notify me for comments via e-mail. Copyright © 2014 - Lifeswanderlust Because live has more spice than you think.